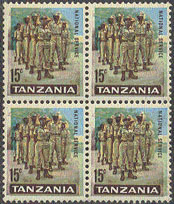 1744 VAR TANZANIA (1965) Army squad*. Block of 4 with color brown shifted resulting in doubling of image. Scott No 7, Yvert No 3.